The Versatus I.V. Catheters are made out of special medical grade polyurethane which becomes very soft at body temperature ensuring patient comfort. The Surflash™ feature is designed to confirm the entry of the catheter in the vein increasing the first puncture success rate. The higher success rate increases significantly patient comfort due to less multiple punctures. Additionally less time and material is used and costs per puncture are reduced. The Surflash™ I.V. Catheters are made out of special medical grade polyurethane which becomes very soft at body temperature ensuring patient comfort. 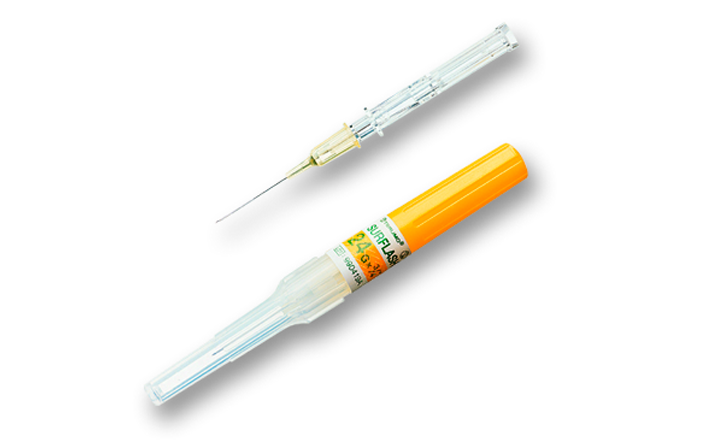 The Terumo needle point design and precisely honed bevel edges in combination with the perfectly tapered and siliconised catheters allow a smooth and nearly painless placement. Additionally the Surflash™ I.V. Catheters are opaque and kink resistant further improving the patient comfort and safety. The Surflo I.V. Catheters are made out of special medical grade EFTE (straight) and FEP (straight,winged,winged & injection port). The carefully selected materials of the Terumo EFTE/FEP I.V. Catheters are designed to ensure a stable form (lower risk of split tips and peel back) during punctures under difficult conditions.